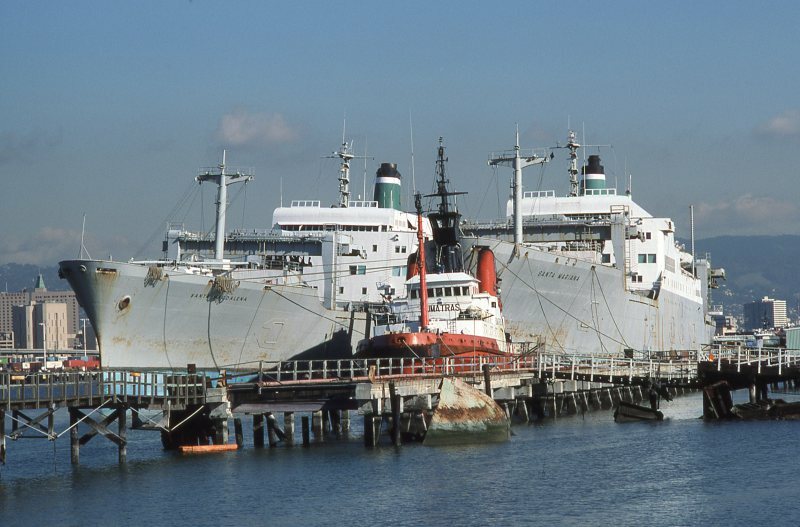 Departing Alameda, CA in December 1987 under tow of Sumatras for breaking up at Kaohsiung. Photo George Lamuth. From my collection. Looks like the remains of some vessel along the pier in the foreground. The pier still exist today, but it looks like that relic is long gone. Hello Leon. I'm not the one who took that photo. It was taken by the late George Lamuth. I have no photos of Sumatras in my collection but there are very good ones on this site. Hello Rene, did you also take pics of only the Sumatras when she left. I would be very interested in pics. I remember seeing them at times at Port Newark, New Jersey, in the 1960s. In those days we could actually go on board and visit! Not anymore! What a fantastic photo opportunity. Santa Magdalena, perhaps my best hitch ever. Great liberty ports, worked just enough to convince the passengers that it was a "working ship", unfortunately not enough time between ports to make any money before spending it all. That's what happens when a hotel chain owns a shipping company. This photo has been shown 2,238 times since it was added to the site.